Through this frame, “April 1968 and Today” investigates the ways in which our society has remained—and perhaps grown further—unequal and unjust over the past fifty years. This examination of societal inequality began with the gallery’s visual art display. 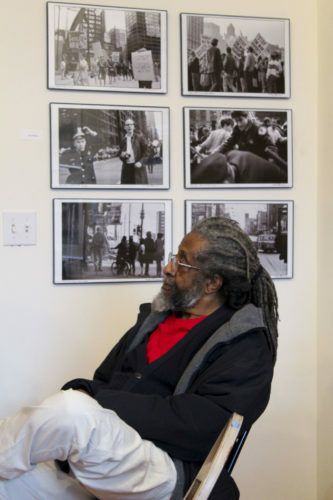 One wall featured Gerard Evans’s photographs of Black organizers protesting in the Loop on Black Friday 2017 and after the Laquan McDonald video was released in 2015. Printed in grayscale and focused on communities of protestors, his photos have a striking capacity to convey their subjects’ emotion. 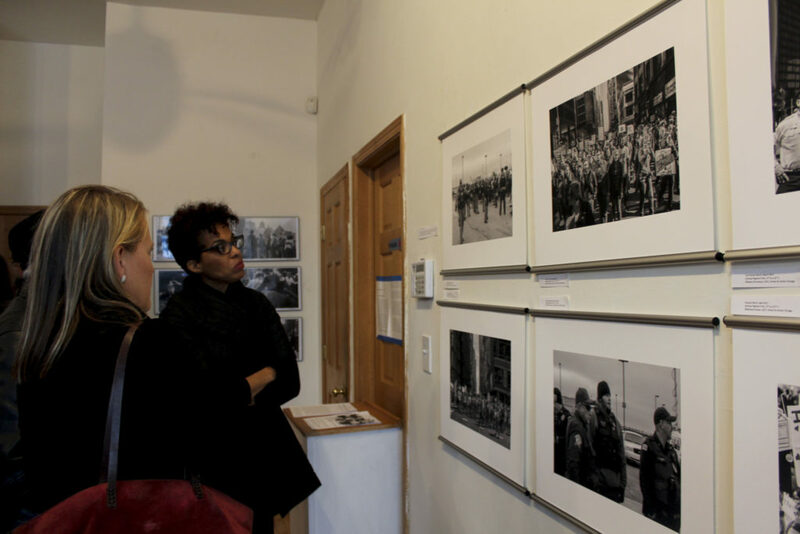 When introduced and given the floor by gallery owner Kathy Steichen, Evans explained that his photography is dually driven by a passion for capturing activists’ energy and by a traumatic event of his youth. Next to Evans’s photographs were Larry Redmond’s from the same Black Friday march. Rendered in color and highlighting police-citizen relationships, Redmond’s work is stunning in the powerful statements it makes through the dichotomies it draws attention to. An activist since the Civil Rights Movement, Redmond now organizes with the campaign for a Civilian Police Accountability Council (CPAC), and uses his camera as a tool of civil disobedience. A departure from Evans’s and Redmond’s work, Kathy Weaver’s art—situated on the opposite wall of the gallery—features a fourteen-foot tall canvas depicting a mobile Eagle Eye police surveillance tower. With airbrush paint and stencil, Weaver depicts the contraption in detail that rivals the scrutiny she sees in surveillance at large. Beyond Evans’s, Redmond’s and Weaver’s work, the gallery displays an array of other art, including works by Marc PoKempner, Carlos Cortez, Nelson W Armour, Michael Kreuser, Peter Kuttner, Fareed Alston, co-founders Christopher Urias and Kathy Steichen, and more. Though gallery guests seemed content to mull over the visual art all night, Steichen eventually corralled everyone into seats and initiated the panel discussion segment of the evening. Moderating the panel was Peter Kuttner, a Kartemquin Films documentarian. He kicked off the discussion by explaining how April 1968 was a particularly memorable month of his life: he was jailed for three weeks after photographing the National Guard as it quelled the riots following Dr. Martin Luther King’s death. He also recalled how the Kerner Commission report had come out just a month before—and how, after King’s death, it had no effect, as the police chose to handle the rioting with violence. With that, Kuttner handed the mic over to his friend Bruce Thomas, who worked in 1968 as a Field Team Leader for the Kerner Commission. “How did it happen that this presidential commission told the truth? Which is that ours is, has been, and continues to be a racist society? Strange as it sounds, no one had ever said that in the form of a government commission,” Thomas said. 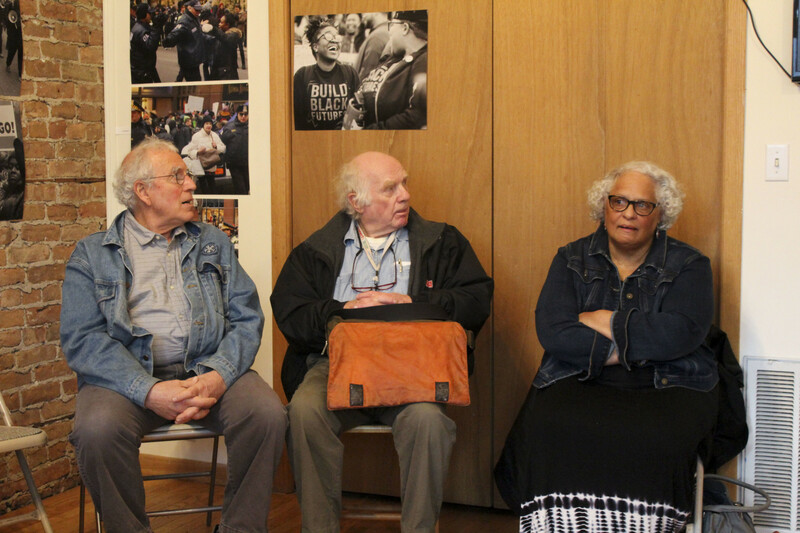 Mary Scott-Boria, a lifelong activist, former Black Panther, and director of urban studies at the Associated Colleges of the Midwest, discussed what life was like living on the West Side during this month of rioting and police oppression. “My mother—who was a white woman—at the time, I thought she was probably the safest person in the neighborhood because they were there to protect her, not anyone who doesn’t look like her. So those were kind of the memories I have. They were there many days,” she said. Scott-Boria used her time in the spotlight to shift the audience’s attention to the lasting impact of the 1968 riots on Chicago’s West Side. She explained how the neighborhoods never fully recovered from the damage inflicted during the riots because the city never helped the area to recover, instead pushing it further and further into disarray. All of this, she pointed out, indicates the fact that separate and unequal societies remain today the same as they did in 1968. An audience member who identified himself as Mr. Skroger piggybacked off what Scott-Boria expressed about the West Side. He explained how when he was growing up in the West Side, there weren’t any serious gangs or drug problems, but that the police moved drugs into the neighborhood, which is what ultimately caused the neighborhood’s downturn. Gallery guests sang along enthusiastically, and eventually began peeling out of the space, the lyrics “brown, red, black and white, all the workers must unite…” ringing loudly in their ears. Maddie Anderson is a contributor to the Weekly. She last wrote about the artistic team behind the Obama Presidential Center in October. Shows at this activist gallery are designed to teach us about our history and provoke discussion about current events and conditions. Sounds like they are succeeding on both fronts! Great report on what sounds like an interesting and emotional event! I wish I’d been able to be there, but the article helps me feel that I was! Your design is lovely, the writing is appreciated! and if you want help improving on the terrible photos you published, feel free to contact me..
the portrait of Larry Redmond in front of my pictures is especially awkward..
but really, mainly, THANKS for writing about the show!